Brigantine Beach....an island you'll love for life! Brigantine Beach, New Jersey is a residential community just north of Atlantic City and is an island bounded by the Atlantic Ocean, Brigantine Inlet, Absecon Inlet and inland waterways. The name "Brigantine" came from a type of 1600s ship; perhaps one of the first of over three hundred vessels wrecked on the notorious offshore shoals - during a two hundred year period. Over 6.30 square miles in area, the island plays host to year round residents and visitors and is home to the Brigantine National Wildlife Refuge - a 20,000 acre national park. Pristine beaches, wonderful waterways and a host of family entertainment venues are found all over the island. 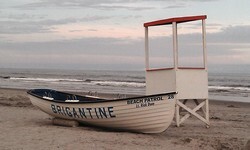 Brigantine Beach is one of New Jersey's premier destinations for living and visiting. Spend the day sailing or kayaking around the island, swimming in the ocean, relaxing on the beach, playing a round of golf at the Links at Brigantine Beach, or just enjoy the natural beauty that Brigantine Beach has to offer! Just minutes from Atlantic City, less than one hour from Philadelphia and less than two hours from New York City! When you visit the beautiful Island of Brigantine Beach for the first time, you will not want to leave! Once you visit our stunning beaches and feel the sand between your toes and the smell of the fresh ocean air, you will feel your dream has come true. You too will come to find that "Brigantine Beach is an island you'll love for life"! Brigantine Beach is just minutes away from Atlantic City's endless casino entertainment and world famous boardwalk. Brigantine Beach truly is "an island you'll love for life"!